West Cheshire is one of the most popular choices in the country when people are deciding on where to set up a new life. Internal migration figures released by the Office of National Statistics reveal that, in 2017, 16,610 people moved to the borough and 14,281 people moved away. This is a net increase of 2,329 people deciding to set up a new home in west Cheshire last year. This follows a net increase of 1,330 people moving here in 2016. The borough is the sixth most popular place to migrate to in the country. Cornwall is the number one choice for internal relocation, with a net increase of 7,092 people choosing to move there last year. Cllr Brian Clarke, Cabinet Member for Economic Development and Infrastructure, said: “The fact that more people are choosing to move to Cheshire West to set up new lives is great news for our community. Cheshire West is an attractive place in which to set up home and do business for numerous reasons. It is considered one of the best places to live in the UK with high living standards and good transport links. The range of housing the borough has to offer provides a significant draw for new residents. There are aspirational market homes in picturesque and historic locations and good quality properties of every type to buy or rent for the more budget conscious, in four urban centres. The number of new homes available is increasing rapidly. Last year, 2,542 net new homes were completed – nearly double the Local Plan target of 1,100 and the fourth consecutive year targets have been exceeded. The trend of house building is expected to continue, with 7,753 new residential planning permissions due to complete in the next five years. There are also more affordable houses being built, with 623 new properties completed in 2017-18. The Council ensures new homes are built to meet residents needs and creates attractive and sustainable neighbourhoods. It has its own housing delivery programme to provide a total of 1,700 new homes across the borough by 2022 on Council land, with 400 already completed. A range of affordable house types and tenures are available including affordable and social rent, shared ownership, starter/discounted sale homes, with supported housing, extra care and lifetime home options and Gypsy and Traveller pitches. The Council also operates a comprehensive Housing Options Service for those who are having difficulties accessing suitable accommodation. Last year, the Housing Options Advice Line received 30,500 calls regarding accommodation and 1,175 households were housed into affordable or social rented accommodation through the Housing Register. Among those who chose to relocate to our borough from another area is Sarah Eden. 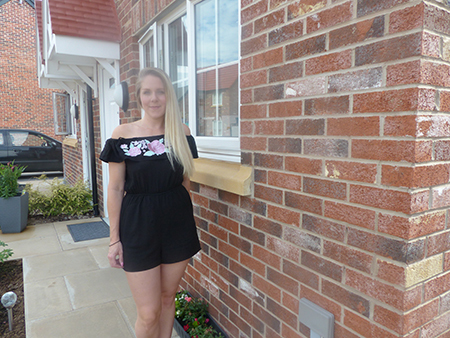 The 30-year-old mum has recently moved into her new home in Winsford, which is managed by the Council’s partner ForHousing, in April after a difficult period last winter living in unsuitable private rented accommodation in Middlewich. Sarah said: “The process to move in here went really fast; it took eight weeks from the claim date to moving in. These houses are really nice and we have been lucky with the garden as well. “I had a private rented property in Middlewich and it was absolutely awful. The damp was awful; we had to go to housing standards. I was paying £595 a month for that. It was illness after illness; we were obviously getting damp on our chests. “We moved back in with my mum in January. I work in Northwich and my son Bobby is in nursery in Winsford so I didn’t want to upset our routine and was desperate to get back here to Cheshire West so Bobby can have a safe place to live. The borough is attractive for families and the standard of schooling is high. Ofsted identified that 94 per cent of secondary schools across the borough have been judged to be good or outstanding in their latest report. Many companies in the borough have signed up to Cheshire West and Chester Council’s Local Living Wage charter and pledged to make a stand against poverty in the borough. By signing up, they are promising to pay all employees a minimum of £8.75 per hour. This rate was set by the Council and covers the real cost of living for employees and their families in the area. It aims to ensure everyone can earn a decent living to help the economy thrive. It’s not just people permanently moving to west Cheshire on the rise. Hotel occupancy levels are at maximum across the borough and footfall numbers in Chester are staying high. June footfall counters registered 2,229,755 people, a steady increase from May and outperforming the national average.